The older I get, the more I start to resent birthdays. Even though today I've unfortuately turned the grand old age of 28, I still feel like I'm 18 and I do lack common sense... So maybe 2013 is the year I finally grow up and act my age?? Hahaha yeah right. Today I shall be celebrating by either - doing my Uni assignment or revising for my stupid HRM in Context exam on Wednesday. The month long celebrations can start at 5pm next Wednesday when the exam is over and done with. Love your cake! Happy birthday & good luck with you exam! What are you doing at university? HAPPY BIRTHDAY!!! Haha that cake is amazing! I might actually make one like that for someone! It is my 30th this year and I simple have no idea how that happened! 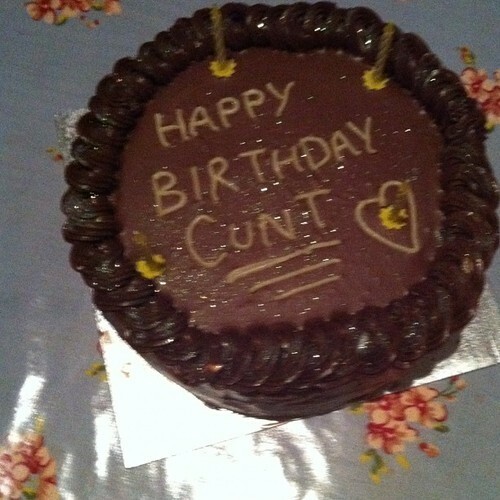 hahaha love that cake, may have to re-create that for my friend's birthday!